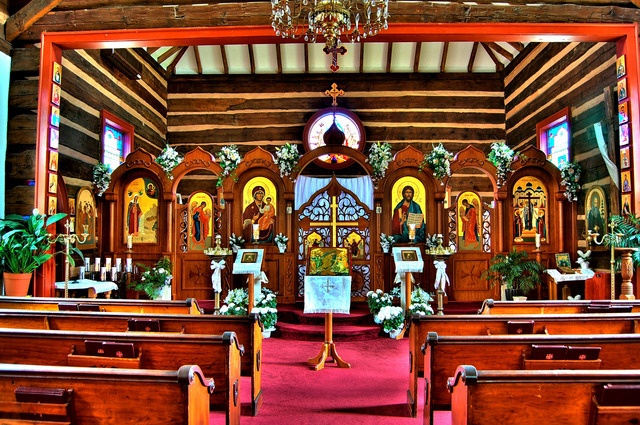 Holy Cross is the only Orthodox church in six counties of northcentral Pennsylvania and one of the most unique church buildings you'll find anywhere! 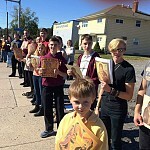 The parish, founded in 1977, is part of the Diocese of Eastern Pennsylvania (doepa.org) of the Orthodox Church in America (oca.org). The Orthodox Church dates back to the day of Pentecost as the One, Holy, Catholic and Apostolic Church of the eastern Roman Empire and exists to give glory to our Lord, God and Savior Jesus Christ, His Father and the Holy Spirit; to worship the Holy Trinity in spirit and in truth and to perpetuate the saving ministry of Christ through the faith once for all delivered to the saints. To this day, She remains unchanged in doctrine and order of worship and stands as a humble witness to the life and belief of the continuing Christian flock. She was and is the Church of the martyrs and the Holy Fathers who defended the divinity and humanity of the Lord Jesus Christ and the proper understanding of the Holy Trinity's revelation to It's creation. Orthodoxy came to America through Alaska in the 18th century and, fed by immigration, spread across the continent, often appearing as an insulated sect open only to people of certain ethnic backgrounds. This unfortunate image of the Church has changed dramatically in recent years as the Orthodox Church has turned Her attention to all Americans who are seeking the joys of fullness and continuity in their knowledge of God's revelation. 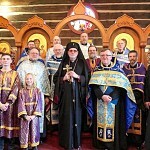 This transition is beautifully exemplified at Holy Cross Orthodox Church in Williamsport PA, where all services are in English and people of all backgrounds are welcomed into Orthodoxy's life of communion with God and the Church's calm, pastoral, yet unflinching resistance to the tragic and seemingly unending compromise of truth and life in contemporary society. The basic structure of Holy Cross Church is a former 200-year-old log barn of hand-hewn timbers, painstakingly dismantled, delivered and reassembled on site from a location some five miles away. 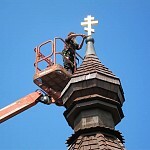 Beginning in June, 1987, over the next 17 months, the pastor and parishioners volunteered their talents and tireless efforts in all phases of the construction process. 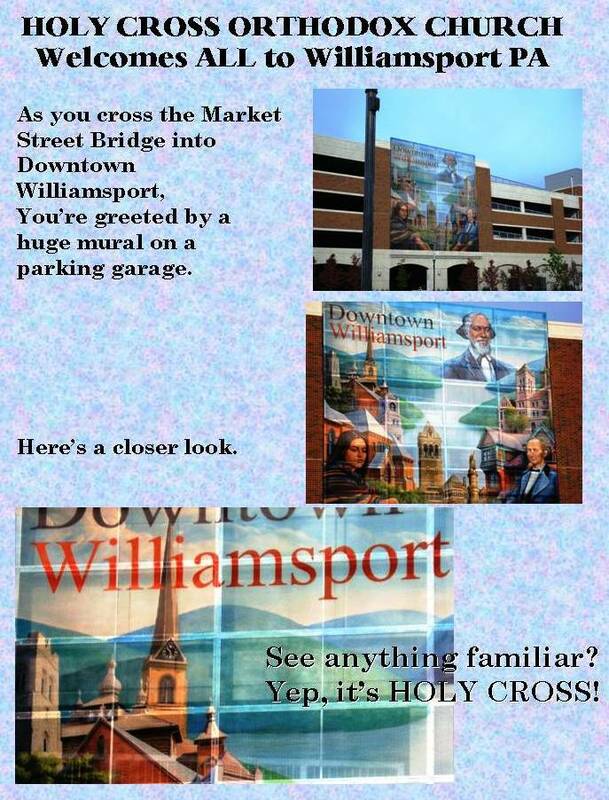 The use of logs seemed appropriate for Williamsport, the one-time 'log capital of the world'. The distinctive 'onion domes' were built on site and hoisted into place as the crowning glory of the church, surmounted by hand-crafted crosses plated with gold leaf. 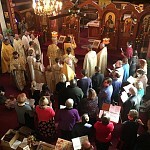 The church was formally consecrated on November 12, 1988 (and has since become affectionately well-known throughout the region as "the little, wooden Orthodox church"). In 1997-98, a beautification project was undertaken including the construction and installation of a new icon screen and hand-painted icons. The church interior has been referred to as "something like heaven". Traditional stained glass windows enhance the incredible beauty of the timeless Orthodox iconography. The parish opened its Orthodox Fellowship Center located directly behind the church in July, 2002 -- another parishioner-built structure. After its opening, the church basement was transformed into our education center with classrooms and a library. Next to the church is our rectory and parish office. Our worship is sung by the priest and people (no musical instruments). Though we usually stand in worship, we do have pews. Children participate in worship together with their families. We offer a host of ministries, weekly education programs and seasonal inquirers sessions. Call us for further info at (570) 322-3020.